Chips and dip, is quite possibly the tastiest snack combo. Although super easy to make (even easier to buy), it’s not exactly the healthiest bite. This recipe gives you the satisfaction of enjoying a creamy dip with chips but without usual heaviness associated with it. 1. In a small bowl, combine and whisk the ingredients until well mixed. 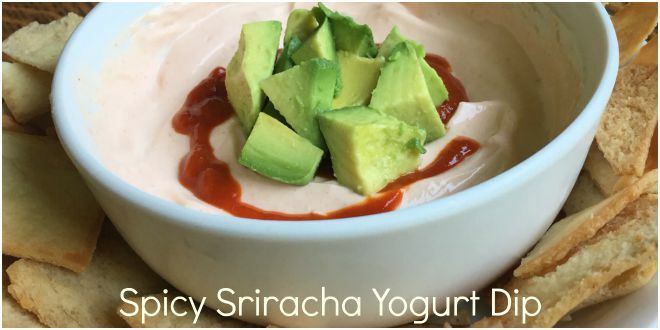 Garnish with diced avocado and sriracha. 2. Grab your favorite bag of chips (pita chips are great with this dip) and dig in! This dip is so good, you’ll have to stop yourself from eating the entire bowl (I know I had to). If you try the recipe, let me know what you think!